Colin Lloyd writes to ask if you can help him with some rowing detective work. 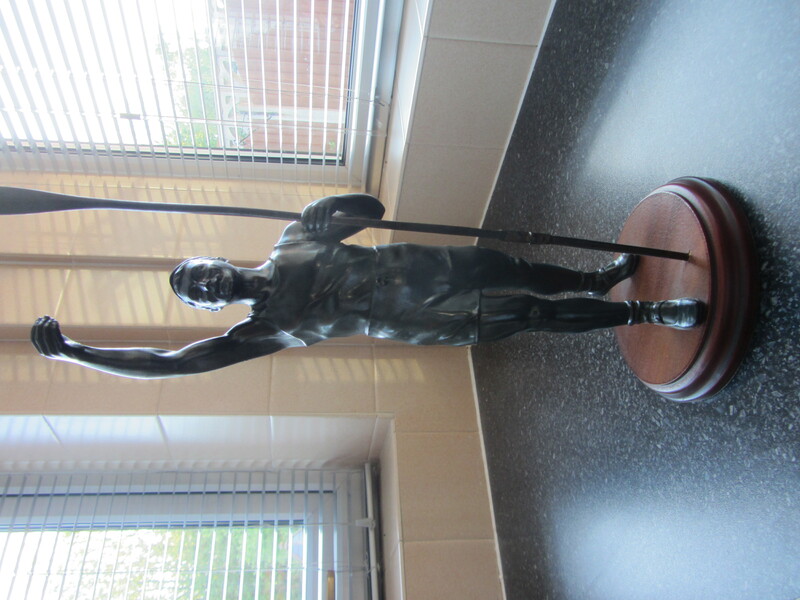 I have in my possession a statuette of a rower that was one of a pair that I purchased from an antique shop in Bude, Cornwall some 18-20 years ago. I believe it to be early 20th century due to the style of clothing. 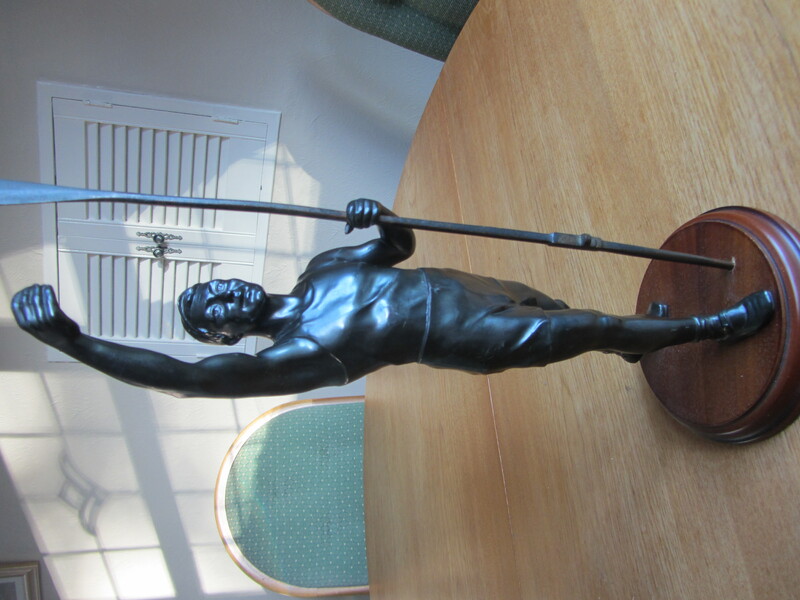 We have always been intrigued as to it’s origin, but have been unable to get any info on it even after sending photographs to the Rowing Museum. They did not seem to be interested in following it up! If you could email me I will send you some photographs to have a look at. The Rower we believe should be holding aloft a trophy of some sort, but it is difficult to anticipate. The blade could be an early example of how they were, or a sea rowing oar. I picked up your name while looking on my phone to see how I could find out, and noticed that you were reviewing rowing statues, 11th Sept 2013. (Rowperfect) This is a statuette 12-18 inches tall. We would love to be able to find a bit more about it. Anyone who can help Colin, please comment below. Are you ready for the summer racing season? How to stop slumping at the catch in rowing Car roof rack for Single Sculls – collect at 8s Head Are your oars safely stored in your boathouse? This entry was posted in Features, Rowing. Bookmark the permalink. Who knows about HIIT for erg rowing? It’s possible it could be Jack Kelly. He was the father of the lady who was to become Princess Grace of Monaco. He won the Diamond Sculls for singles at Henley Royal Regatta representing Harvard. The oar depicted is a sculling blade of the ‘pencil’ type commonly used at the time. The missing trophy could have been the ‘Pineapple Cup’; a solid silver gilt item awarded for posterity to every winner of the Diamond sculls. Another possibility is Stuart McKensie of Australia who won the Diamond six times. I stress these are guesses. Hope this info is of some use. I certainly do think there could have been a trophy in his right hand, and awarded in memory of Jack Kelly. I am afraid I would discount Stuart McKensie, I remember him in my youth, and I feel the statue is older than that. Monty’s reply has given me a lot of food for thought. Hi. 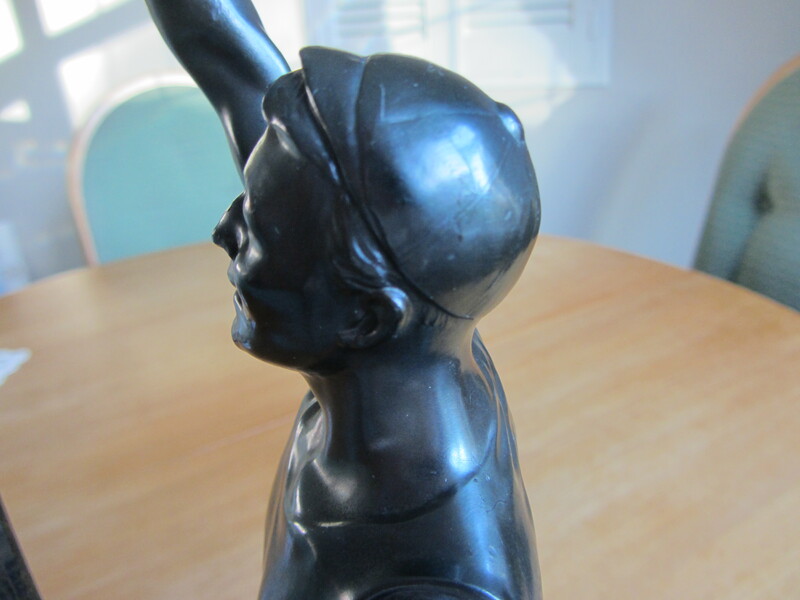 Your statuette has seen better days. 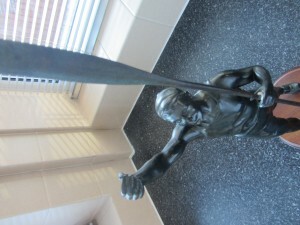 The oar is not an original as is evidenced by it not correctly fitting the left hand. The Auckland Rowing Club has the same trophy (more or less) which suffered the same fate. The right hand however in the ARC version is holding a circular laureates wreath aloft. The wreath is attached by means of a small solder and it is not surprising that over the years it would have been lost from your example. The ARC example dates from 1923 & was supplied by a local jeweller whom we presume sourced the trophy from the UK as was common practice for the time. Good luck with your research. Regards Monty Wawatai Honorary Historian, Life Member, The Auckland Rowing Club (est 1869). Hi there Colin. 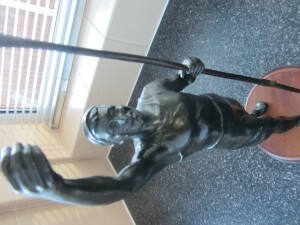 The oar is not the original for this statue as is evidenced by it not fitting completely within the left hand, being of the incorrect scale and different material(?). The statue is most likely also not sitting on it’s original base either. The right hand would typically be holding either a circular laureate’s wreath or small trophy. The original oar and wreath/trophy were quite typically broken, bent / lost over the years as they were usually only secured via a very light solder. More likely this is what has happened to this example and restoration(s) have been attempted including the retrofitting of the oar and securing of it into the new base via a clumsily applied drill hole. These trophies were cast in significant numbers during the mid and late 1920s. 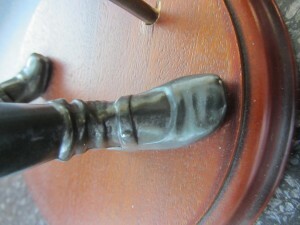 However, the level of detail in the face, cap attire and footwear, mark this as a particularly fine example. Many thanks for your comments, but Whoops! I drilled the hole in the wooden base some years ago, that’s irrelavant though. You are exactly right, the original base was white marble, and I substituted it for the one you see. Your comments prompted me to look closer at the statue, and I do agree with you. The oar is of a different material and in fact is not really a true replica of a “blade” as we know it. The button looks as though it has been fashioned by someone with very little knowlege of rowing; it is also a very loose fit in the left hand. But my wife fixed that with the help of a little “Blue Tac”!. 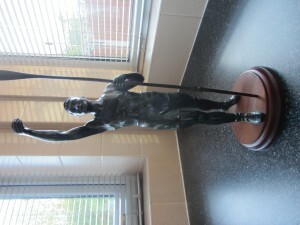 When we purchased the statue, as I stated there were two with only one oar, and that was placed in the right hand would you believe!. We picked the best one, to include the oar. I would be really keen to know if they were given as prizes, or just as a figure to be purchased from a store. I certainly take on board Terence Chipchakes comments regarding it possibly being awarded to every winner of the diamond sculls as a figure of posterity to Jack Kelly. My wife and I are very grateful to you for your comments, we have been wondering for many years. Hopefully we will get the answers. The rower clearly has high cheekbones and could be Jack Kelly but somehow it doesn’t quite look similar enough. I think it looks rather like Jack Beresford. Take a close look at the side profile close up photograph above and note the shape of the nose and high cheekbones and compare it with the image at the link below. There are photographs of Beresford wearing caps (not unusual for rowers I know) and the style of shorts also shown above (also not unusual). I’ve looked for photos of Beresford wearing the style of shoes shown in the detail above but without success. Maybe someone else can add the missing link. I wondered if it was Jack Beresford. If you look closely at the first image shown above (the close up side profile) and compare it with the photo of Beresford found at the following link …. …you can see that the high cheek bones and particularly the shape of the nose are quite similar. I’ve seen photos of Beresford wearing caps and shorts that are that style (not uncommon but as we are struggling I’ll take any supporting evidence) though have not been able to find a photo of him wearing the type of shoes shown in the photos above. There are a number of film clips on the web showing Beresford from different angles and to me the face seems very similar to his.